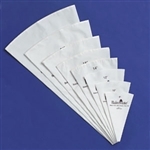 We have top quality disposable, re-usable, and heavy duty pastry bags in stock! Do you enjoy baking but can’t find the quality baking supplies you need? Are you always wondering where to buy supplies like pastry bags? Don’t waste another dollar on something that doesn’t work – order our pastry bags and parchment paper here for the quality you’ve been waiting for at prices you won’t find anywhere else. 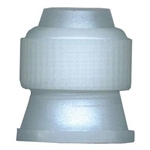 Whether you’re looking for disposable pastry bags or reusable icing bags, we offer a variety of heavy-duty options of various sizes, ranging from 12 to 18 inches. You’ll also be able to choose whether you’d like just a few bags (perhaps choose our five-pack) or need a lot (perhaps choose our 100-pack). We also offer top-quality nonstick parchment paper for baking. You’ll love how easy cleaning up is when you bake your sweet treats on one of these baking liners. Don’t spend another minute searching for pastry bags and baking parchment paper online – order yours with us and see what a difference it makes having the best-quality supplies. What’s more, you’ll get free shipping on all orders over $100. Order bulk baking supplies now!